Terracotta, cast in a mould. Received in 1953 from the Kwarasm expedition of the Institute of Ethnography attached to the USSR Academy of Sciences, Moscow. First publication. 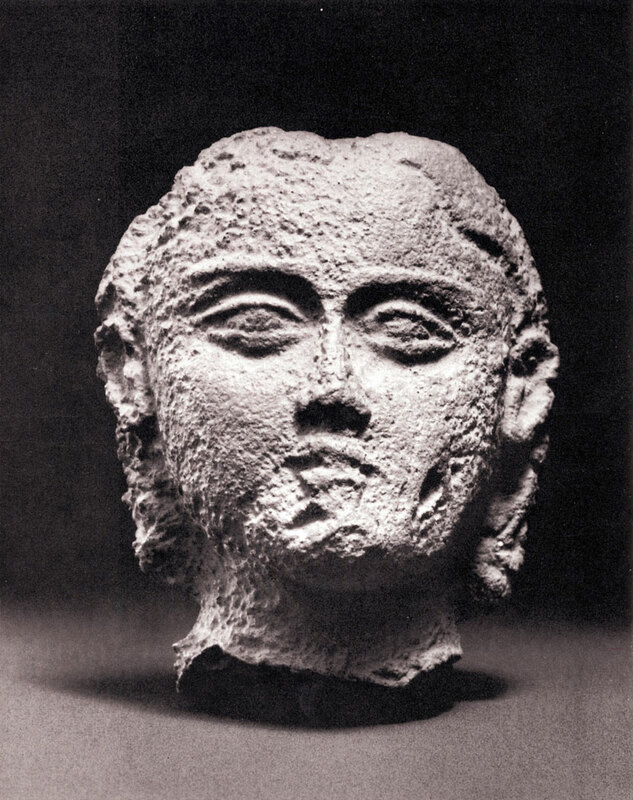 Small-scale terracotta sculpture was wide-spread in ancient and early medieval Central Asia. A number of terracotta figurines were discovered at Afrasiab (Samarkand) and at the neighbouring sites of Tali-Barzu and Kafyr-kala at Termez, as well as in Merv, Khotan and Kwarasm. The techniques used in making them were more or less the same throughout Central Asia. Moulding was the predominant method, although modelling by hand was also occasionally used. Moulded figurines were often finished by hand. The back of most figurines-even of three-dimensional ones-is flat. The plastic art of Central Asia was directly linked with its cults and popular mythology. However, reality also served as a source of imagery. Terracotta figurines might have sometimes been evoked by some monumental prototypes. Since most of these articles were found in private dwellings, it is likely that they served as amulets or protectors of the family hearth. Although real or fantastic animals are not infrequent among the motifs in terracotta sculpture, representations of people, clothed or naked, - horsemen, musicians, etc.-occur more regularly. Despite the general similarity between terracotta figurines produced in Central Asia, certain local stylistic features are clearly observable. It is hardly possible to identify the Angka-kala figurine-it is badly damaged-but it still has a great interest as a typical sample of handicraft from the Kwarasm area. Its stylistic affinity to other terracottas of the same period from other Kwarasm sites is beyond doubt. The Angka-kala figurine is remarkable for an attempt at three-dimensional treatment, although with scarcely any detaliza-tion of forms, for its elegant proportions and exquisite and expressive modelling. Clay, with stamped and moulded ornament. Received in 1966 as a gift from the A. Smirnov collection. The body of the vessel is decorated with stamped and applied moulded rosettes. Similar rosettes decorate both spouts, which are shaped as horse-heads. Representations of horses in Central Asiatic art go back to remote antiquity-to the 1st millennium BC. The earliest known ones are the rock drawings of Aravan and Ayrymachtau in Fergana associated with the cult of the horse which was practised there and in some other areas of Central Asia. According to Herodotus, Central Asiatic nomads sacrificed horses to the Sun, for they believed that the swiftest of gods was entitled to a sacrifice of the swiftest animal. The representation of a horse on a ewer is quite natural, for the ancient Central Asiatic pantheon included aspi-obi, a water-horse, the patron of water, which was often represented together with a fish, the symbol of water. Aspi-obi was one of the favourite folklore characters from ancient to fairly recent times. Clay, with underglaze slip decoration. Acquired in 1934 from the B. Kastalsky collection. First publication. 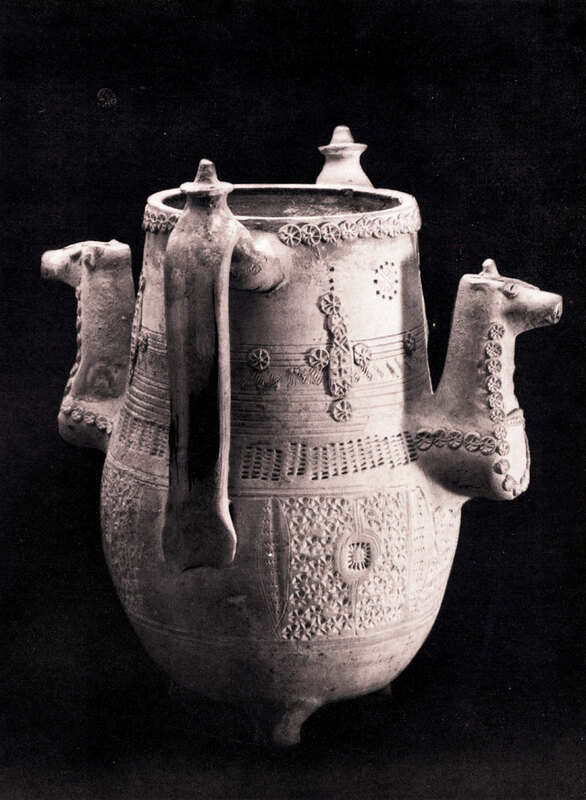 Earthenware vessels from Afrasiab are justly believed to excel other medieval pottery from Central Asia and Middle East. They display a remarkable variety of forms, sizes and ornamental motifs. 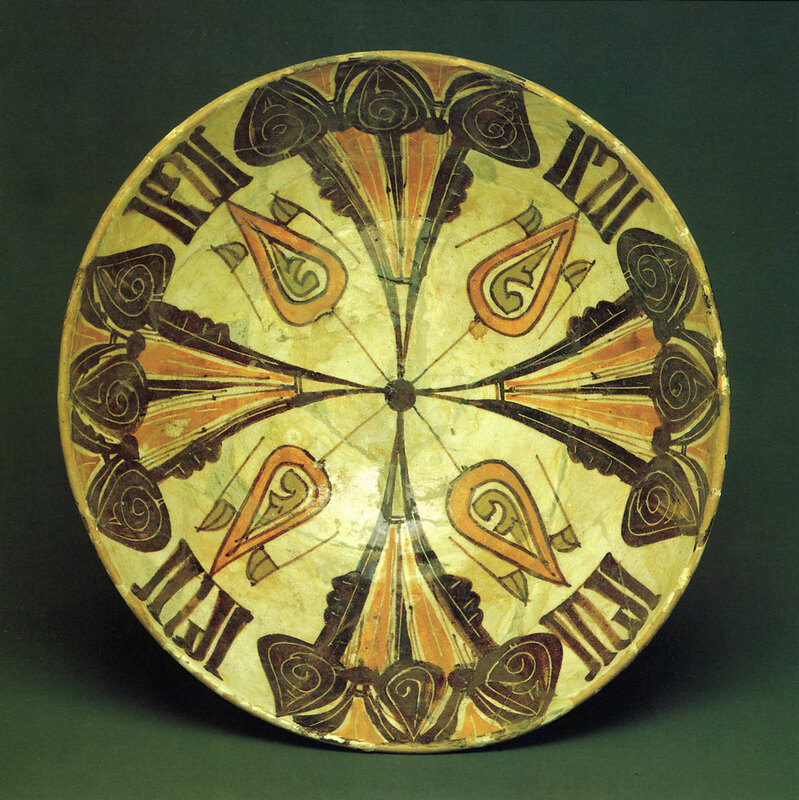 The typical ornamental technique of this pottery-polychrome underglaze painting in slips-was widely used in Afrasiab and some other centres of Central Asia connected with it. This elegant thin-sided bowl is painted on the inside in floral patterns against a white background. The intricate lotus- and palmette-like motifs rendered in deep restrained colours go back to the antique art of West Asia and to the rich legacy of pre-lslamic culture in Uzbekistan.